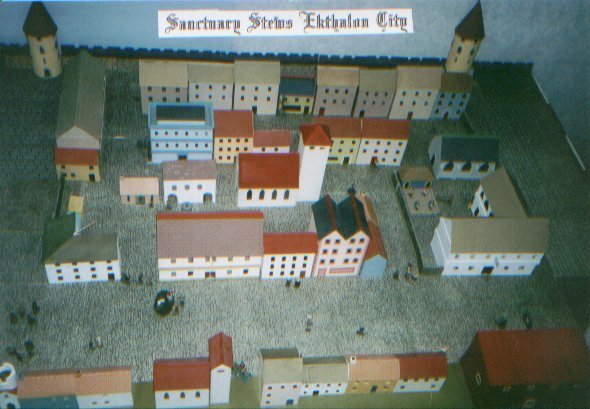 This module was used as a public participation game at 'Claymore 2001' the main Scottish wargames convention. Its story line was a follow on from 'The Adventures of Morgana ' trilogy, whose first book 'Exiled!' we expect to publish February 2002. This was created by role-playing and was itself a sequel to another action we are producing as a module, 'Mission to Kill the witch Queen Bettrys.' The rules used were the four page, Simple Abridged Morval Earth Fantasy ones, also issued free from this web site. Doubtless the module can be adapted for other sets. It is assumed that the players will operate using their map and finding their way by sight and asking questions. Four years ago, King Reginald and Queen Bettrys of Foix, were murdered and Princess Maudette imprisoned, for suspected witchcraft. Now free, the Princess is also financially well placed enough, to pay for the retribution that is her Obligation de Famille. She has offered Don Incio Fulminar and his party 1,000 Gilden Pezzi for executing each of the three assassins, believed to be hiding in the city of Ekthalon. These Assassins, Formio Futrotte, Hedban and Cordelia, were members of the Thieves Guild of Valles and stole the Guilds Funds. Agents from the Princess have produced two members of the Guild, who can recognise the assassins and are ready to help, for a share of the rewards. Don Incio and the other five members of the party, are survivors from the 'Adventures of Morgana' saga. They are a little handicapped in that Ekthalon is the capital of Thentis, a Kingdom where the Church of Eru has a monopoly. From a Priory in Thentis, Morgana's party rescued Princess Maudette, committing crimes of sacrilege, cleric slaughter, aiding a witch and damage to Church property. The Order of St. Judas, the Church's police force, wants them to help them with their enquiries into this matter. They have set Inquisitor Hewel, to track down and deal with, any of the party involved. Since Inquisitor Hewel was captured and ransomed for 4,000 Gilden Pezzi by Morgana and friends, he has a very personal interest. Don Incio wishes to complete the mission and escape, before their presence in Ekthalon becomes known. He feels they are somewhat conspicuous. Apart from the two Valles thieves, the six other members of the party, come from separate states and the dwarf and the dimini (Halving) are particularly noticeable. Willow, Morgana's half sister comes from the Chaotic State of Narchad and worse, has magic powers. The Church of Eru allows only its own members to cast spells, all others being guilty of witchcraft. The temporal laws of King Eudes, allow considerable latitude to foreigners but the Order of St.Judas, is ruthless to any one they catch practising illegal magic. Starting from Charles, the capital of Bara, they ride down to Pincelle, where they embark ready to sail up the mighty Arwyn River to Ekthalon. The ship, the lymphad 'Dame Morgana', is the one Inquisitor Hewel had been using as the St.Crispina, so it might be recognised. The ship counts as Baratrean property, so legally the Order cannot board it without creating a diplomatic incident. To help justify their actions the Party has writs, a Sentence of Death from princess Maudette and three individual Death Warrants from Valles City in Perigord. It would be up to the Thentian authorities whether they accepted these, in the event of trouble. Click on the picture for a better view - all buildings home made by John Mumford. The party arrives at Ekthalon City port overnight but will not be allowed into the city until after curfew at dawn. They plan to reach the Sanctuary Stews around the ninth hour of the morning of Workday (Tuesday). Apparently most of the runaway serfs who live there, will be away working on the new city wall on the East Side of the city by then. The remaining inhabitants will be resting from their evening activities. None of the party has been to Ekthalon before. Since Inquisitor Hewel's Order of St.Judas will pounce on them if recognised, this is a good thing. They question sailors and port workers about the Stews and gain the following information. There are two street entrances to the area, both usually thronged with beggars and guides. Consequently the party decides to split into two squads, North and South, one to each entrance. The area is under Church Law, policed by the bailiffs hired by the Friars of St.Frederick. The city watch and the Order of St Judas are normally barred from entry but the Kings guards can go anywhere in the city. The Suicide Alley between the Sanctuary and the city wall is out of bounds and is covered by springalds in the towers. The city watch, also mans turrets in Citadel Way, covering the Sanctuary with a view to apprehending criminals leaving it. Inegenio Droghiere's Ombardi Bank (and or Pawnbrokers) is located in Serf Row. It is believed that King Reginald's melted down crown, was sold to him four years ago. According to the Valles Madame, Belle Beauregard, Formio Futrotte is now called Beadle Florien de Perigord. The Friary of St Frederick is in the NW corner of the Sanctuary, they are responsible for licensing all residents in the Sanctuary area. Hedban and Cordelia will also have changed their names. There are known to be a Stews (public bathhouse) a general store, a pawnbrokers, a brothel, a healers, a scribery, a luxury tailor, two large Inns and a stable. All of these may have information they think. Most of the information needed by players is given on the character cards issued. The Rules used are 'Morval Earth Fantasy Rules'. THE UMPIRES DECISIONS ARE LIKELY TO BE FATAL! Go to Umpire section ONLY if you are not going to be a player.